In 4-quart Dutch oven or saucepan, heat 1/4 cup olive oil over medium heat. Add 5 cloves garlic, finely chopped; stir until fragrant. Beat in 1/4 cup all-purpose flour with whisk 1 to 2 minutes or until thickened. Gradually beat in 1 carton (32 oz) Progresso™ chicken broth. Add 4 cups chopped broccoli florets. Heat mixture to simmering; cook about 10 minutes or until broccoli is tender. Add 1 package (8 oz) Kraft™ Velveeta™ original cheese, cubed, 1 1/2 cups shredded mild Cheddar cheese (6 oz) and 1 cup shredded Monterey Jack cheese (4 oz); stir until combined. Simmer a few more minutes; season with salt and pepper to taste. For this recipe it’s best to shred your own cheese and avoid pre-shredded cheese packages. This will help it melt more smoothly. Try adding extra veggies to bulk up this delicious soup! Add 1/2 onion, diced, when adding the garlic. Add 1 cup shredded carrots when adding the broccoli. 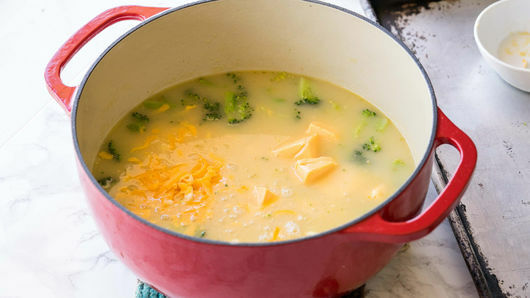 Serve this hearty and cheesy soup with Pillsbury™ crescent rolls for a complete meal! 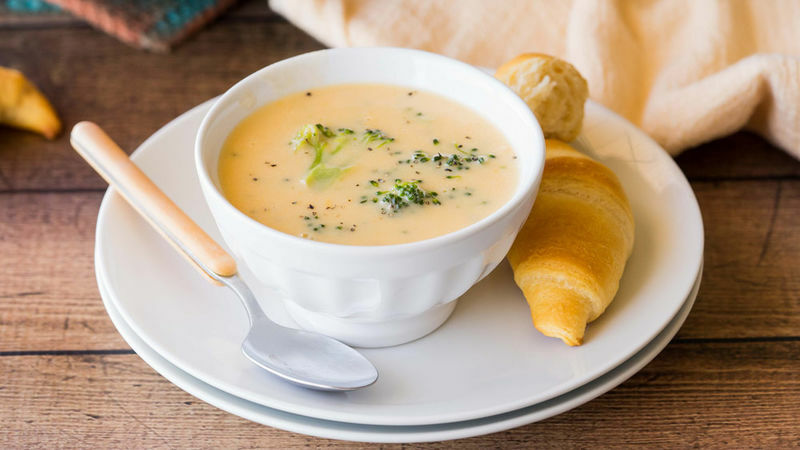 If you’re having a hard time getting your picky eaters to eat their veggies, you’ll want to give this recipe for broccoli soup a try. 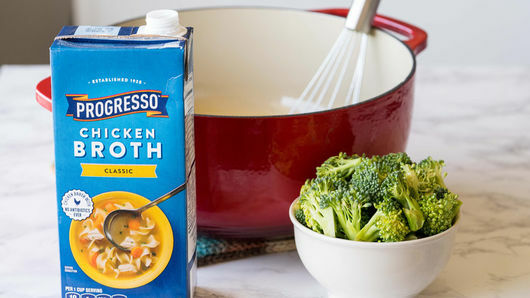 It’s cheesy and comforting, so the kiddos will love it—but it’s packed full of broccoli florets, too. And broccoli has all kinds of nutritional benefits. It’s rich in antioxidants, fiber and vitamins A and C. Plus, it’s usually available in grocery stores year-round, so you can keep this recipe on hand at all times. Have some big broccoli fans in your house? Then we have more broccoli soup recipes for you to make, plus tasty ways to make them taste even better.